Cannabidiol (CBD) is one of 113 active cannabinoids found in the cannabis plant. While in a crowded cannabinoid space, CBD has a dominant presence in cannabis — making up 40% of the plant’s extract. High CBD strains can make up even higher percentages of the cannabinoid makeup. Cannabinoids are concentrated in the trichomes of the cannabis plant but are present throughout almost all plant material as well. Cannabinoids are the molecules that interact with your body’s cells to produce a wide range of physical and mental effects. Their interactions with one another, in what is known as the “entourage effect”, account for the drastically different subject experiences once can encounter while under the influence of cannabis. High CBD strains have a high concentration of the second most abundant cannabinoid: Cannabidiol (CBD). CBD is shockingly different in the way it interacts with the body, as compared to the most famous cannabinoid, tetrahydrocannabinol (THC). Where THC puts your endocannabinoid system into overdrive, CBD actually doesn’t have a strong affinity for CB1 or CB2 receptors. CBD is actually is an antagonist of cannabinoid agonists! That means the CBD molecule doesn’t activate your endocannabinoid system the way that THC does. CBD even works to actively block the effects of cannabinoids like THC. This probably drives its supposed importance in being able to “curtail” a high. Interestingly, CBD has also been shown to encourage 5-HT receptors. These receptor types are classically involved in the emotion regulatory system. Thus, CBD could, theoretically, be used as an antidepressant. However, the most important implication of this molecular property is that CBD is non-psychotropic (i.e. it won’t get you “high”, per se). The fact that CBD, when isolated from the rest of the cannabinoids, will not produce a psychoactive effect is a large factor in why CBD is legal for sale in most states across the country. CBD, especially when in the presence of THC, has been associated with a wide range of medical benefits. CBD, often times, carries the medical weight in the term “medical marijuana”. Patients looking to solely reap the benefits of cannabis for medical purposes should like to find high CBD strains. Depending on their THC content, high CBD strains won’t necessarily get you “high”, but they are potent when it comes to medicinal value. What are the medical benefits of High CBD Strains? The term “medical marijuana” is substantiated, mostly, by high CBD strains. Since CBD has a decorated set of references speaking to its medical benefits, strains that have more of it are the focus of growers looking to provide genuine medicine. This is not to discount THC. THC also has medical benefits. However, its reputation for being able to produce a strong psychoactive effect overshadows its purported medical benefits. Most consistently, CBD has been praised for its anti-inflammatory effects. This leads to its efficacy in helping with body convulsions, like the seizures experienced by epileptic patients. CBD gained credibility in the popular media after several potent anecdotes asserted its efficacy in treating Dravet syndrome — a devastating form of epilepsy that begins in infancy (Ref 5). Perhaps the most famous case is that of then 2.5-year-old Charlotte Figi — the youngest medical marijuana patient in Colorado. Charlotte’s Web is a high CBD strain of cannabis named after the success story of 6-year-old Charlotte Figi (pictured above), a cannabis patient who successfully used cannabis to treat her Dravet syndrome. Charlotte was suffering from over 300 grand mal seizures a week caused by her Dravet syndrome. After reaching a dead-end in treatment options, Charlotte’s parents tried a strain of cannabis that was high in CBD and low in THC. The results were shocking. Charlotte’s seizures dropped dramatically, almost immediately. Since Charlotte was so young, the fact that high CBD strains didn’t induce a psychoactive was an incredibly positive factor for her parents. This point continues to encourage hesitant users to consider cannabis as a medical treatment option for their children. This CBD success story sparked the development of a strain of cannabis specialized for helping patients with Dravet syndrome: Charlotte’s Web. That not all! Studies have shown that CBD is an anxiolytic, antipsychotic, analgesic, anti-inflammatory, antioxidant, and is antispasmodic.CBD has also been shown to reduce seizures, blood sugar levels, assist the function of the immune system, lower the risk of artery blockage, and reduce nausea. Furthermore, CBD can be used to inhibit cancer cell growth, is neuroprotective, and promotes bone growth. CBD has even been shown to play a role in preventing the short-term memory loss associated with THC (Ref 1.). CBD has also been shown as a neuroprotectant in animals (Ref 6). Even users without a debilitating medical illness stand to benefit from CBD. CBD, when consumed regularly, has been shown to counteract the negative side effects of high-THC use. As a result, many daily cannabis consumers supplement their recreational use by also smoking high CBD strains. Fortunately, CBD also has a way to curtail a cannabis-induced high. Users that get “too high” often turn to a high CBD strains to help “level out” their experience. TThis claim appears anecdotal in nature, as a review found that there was sufficient evidence to conclude that CBD has an antipsychotic effect (Ref 2). However, other evidence posits CBD as a potent contributor to the prevention of cannabis-related psychosis (Ref 3). This is almost certainly driven by the fact that CBD prevents THC from acting in full force (i.e antagonizing the agonism that THC has on the endocannabinoid system). When cannabis was sold exclusively on the black market, major pressure was put on growers to produce strains with a higher THC content. This was to satisfy the demands of the predominant customer base: those looking for a mind-altering experience. However, now that medical cannabis has been sweeping the world by storm, growers are currently developing more CBD-rich strains. Which brings us to our next question: What are the top high CBD strains? What are the top High CBD Strains? Many medical marijuana patients need top quality cannabis to match their medicinal needs. While most strains these days are grown for the sake of optimizing THC content, the second most common cannabinoid, CBD, is known to have a plethora of medicinal uses, as outlined above. Below, we’ve listed out the Top 9 High CBD strains. These strains put the “medical” in medical marijuana. Check them all out on WoahStork. These high CBD strains are available for purchase online from dispensaries in your area.You can order pickup or delivery for these high CBD strains after registering for WoahStork, here. 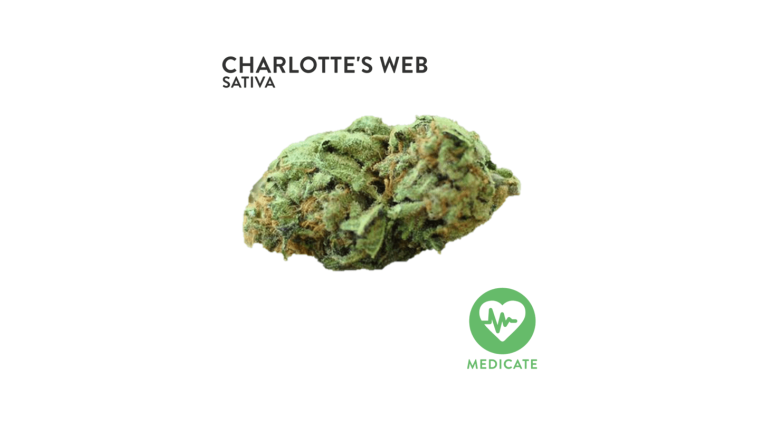 Charlotte’s Web — No list would be complete without this high CBD Sativa. This strain’s name is an homage to Charlotte Figi, who is one of the classic cannabis success stories. Charlotte, now 6 years of age, uses this strain to treat her Dravet syndrome. Harlequin — Harlequin combines four genetic varieties of marijuana to achieve its unique effects. With almost no psychoactive properties, Harlequin has a sweet syrupy taste and leaves the patient clear-headed and alert. The high CBD content alleviates the paranoia of THC while enhancing the painkilling properties. Cannatonic — A cross of G13 Haze and MK Ultra, this hybrid strain contains almost even amounts of THC and CBD. Cannatonic’s buds smell a lot like a sativa. However, the high affects the mind and body fairly equally. Some patients may notice a leaning towards Indica due to CBD’s soothing and sedative effects. ACDC — ACDC is a sativa-dominant phenotype of the high CBD cannabis strain, Cannatonic. ACDC’s THC levels range from 0.42 percent to 1.2 percent. ACDC has a strong euphoric impact on your body that promotes a sensation of calmness. Patients tend to become more focused on their work after ingesting ACDC. Violator Kush — Violator Kush not only has a high CBD content, it also has a high THC content. Thus, it’s a favorite amongst smokers looking for serious pain relief that is also accompanied with a “couch lock” high. Violator Kush is also reported to be surprisingly talkatice. Violator Kush is the perfect strain for the medical user who also cherishes the recreational benefits of cannabis. Dark Star — Dark Star was probably named after the Grateful Dead song that bears the same name. However, Dark Star offers so much more than a jam-session booster. This high CBD indica strain is known for treating pain and anxiety by way of a heavy ceberal calming sensation. Dark Star is a cross between Purple Kush and Mazar-I-Sharif. Midnight — Midnight is a high CBD strain popularized by the nation of Israel. Known for fighting pain while still allowing for cognitive awareness, Midnight is the perfect daytime medical strain. Sour Tsunami — Sour Tsunami is a high CBD strain that is a cross between the famous Sour Diesel and Tsunami. Sour Tsunami CBD levels test as high as 10 or 11%, while THC is usually under 10%. Since Sour Diesel is such an energetic strain of cannabis, users of Sour Tsunami will likely appreciate the strain’s ability to keep them awake and active without sacrificing medical potency. Pennywise — Pennywise is a high-CBD indica with Harlequin and Jack the Ripper as parent strains. The name bears a clever homage to the punk band Pennywise whose mascot is a killer clown. Get it? Harlequins are young clowns and Jack the Ripper was a famous serial killer. Anyhow, Pennywise is known for its effectiveness in treating PTSD. The ratio of CBD to THC is 11 to 1, making its psychoactive effects negligible in comparison to its medicinal effects. The WoahStork team suggests always keeping a high CBD strain on deck! Not only does sprinkling a little bit in your next joint do wonders to combat the negative side effects of long-term cannabis use, it’s great to help bring down your high. However, these motivations to stock up on high CBD strains pale are nothing in comparison to the undeniable medicinal benefits these strains contain. The fact that high CBD strains can solve a variety of medical ailments without interrupting your daily routines by rendering you inoperable by a “high”, is a true natural blessing for professionals and children alike. Frood, Arron. “Key ingredient staves off marijuana memory loss”. Nature. Retrieved 6 October 2015. Can Cannabis Help Treat Alzheimer’s Disease?